First visited in July 2010. Last visit 6th May 2011. Dream Sauna is a smallish bathhouse in Yong San Dong (용산동), Daegu and is a five-minute bus ride from Song-So, Mega Town where the Lotte Cinema Complex is. Since my last visit there seems to have been a few changes and I found more to appreciate than on my first visit. The bathing facilities are modern and clean with a large cold pool, large warm pool and smaller hot and ‘event’ pools. 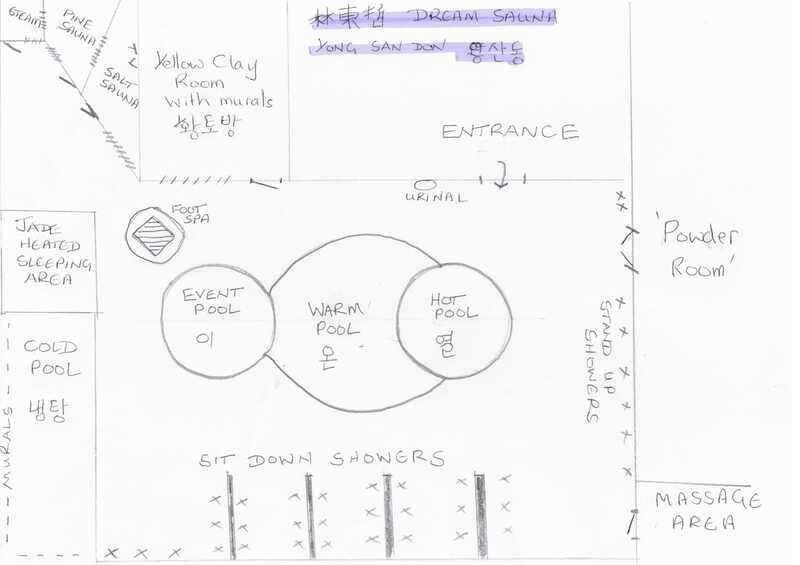 The saunas include a steam room, pine sauna and a yellow mud sauna (황토방) with a charcoal wall, interesting art work and a resident television. The salt room (소금방) is fantastic as the salt is ankle deep on the floor and at first you think you’re entering a room of snow. You can even lay in it though the room is not specifically designed for this. The salt ‘font’ and seats have all been decorated to look like they are encrusted in rock salt. Quite an enchanting room. The salt sauna houses the television which can also be viewed from two other sauna rooms. The large cold pool, beside a small jade, ondol sleeping area, has tiled artwork of dolphins above which three windows with colourful ocean scenes, are illuminated by sunlight. The smaller windows down the side of the bathhouse have floral designs. With bright tiling, the ambiance is light and roomy and a contrast to the black marble of Hwang So. The bathhouse: has a large rectangular changing area with a small recess containing a television and sofas for relaxation. There are around twenty sit down shower units and a bout the same number stand up showers. Shoe shine and a barber are on site. Ambience – bright, very clean bathhouse. Waygukin – none but only my second visit. Where is this located? Can you send me directions so I can show a taxi driver. Or just walk from Daegu train station?